As many people have experienced, life truly can change in an instant. Recent CPL graduate, Connor, knows this fact all too well. However, despite becoming paralyzed from the chest down in a tragic diving accident, Connor has resolved to never let anything hold him back. Living as a C-5, C-6 quadriplegic since 2009, it was necessary for Connor to adapt his lifestyle in order to regain some of his independence. With the help of human and mechanical aides, he has continued to live on his own, drive a car, graduate from college, and maintain a healthy and active lifestyle. Unfortunately, there were still a few things that prevent Connor from feeling safe and independent on his own. 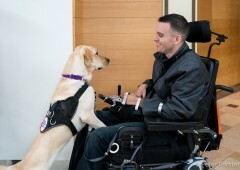 The question always on his mind was, “What could make my life easier?” Having grown up in a household with dogs and a mother who specialized in dog obedience training, Connor naturally thought about a service dog. 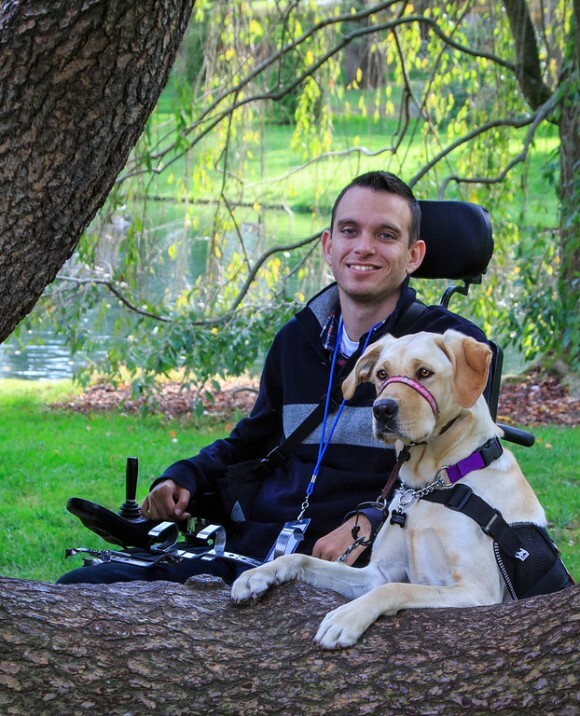 He was aware of what a service dog could do for him and he decided to pursue this possibility. In an internet search for service dog programs in the northeast, Connor came across Canine Partners for Life and two other somewhat local organizations. After reviewing all his options, Connor chose to approach CPL because they were highly rated and seemed like the best fit for him. Not only was CPL fairly close to home, it had the level of training and support he was looking for. Connor decided to truly commit to this process and drove seven hours to CPL for his initial interview with CPL staff. He wanted to see the campus and meet the trainers. He knew this would be a considerable commitment and wanted to make sure CPL was the right fit for him, which is something he couldn’t do over the phone. While the interview was more intense than expected, Connor truly appreciated that CPL staff took the matching process so seriously. He was also fortunate to speak to a recipient in training about their experience while on campus. After this visit, he felt sure he had made the right decision. The culmination of Team Training is a graduation ceremony which recognizes the hard work of each graduating team as well as those who have contributed to the development of each team. At this ceremony, Connor was particularly moved by the incredible transformation each of his classmates experienced in just three weeks.